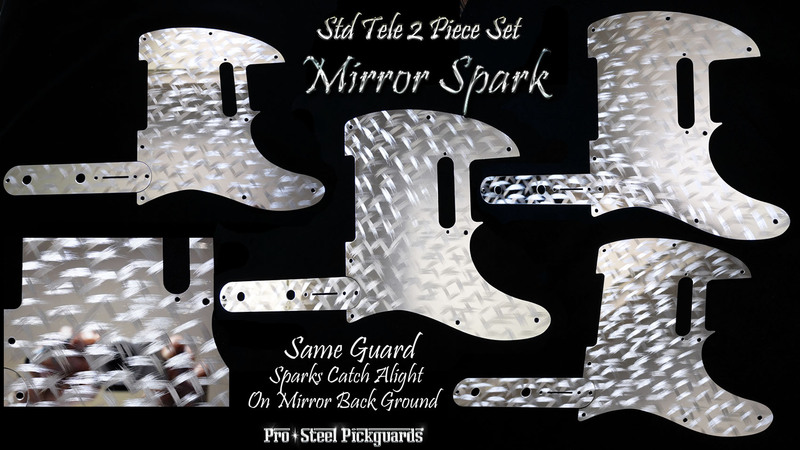 'MIRROR SPARK' MATCHING SET GUARD AND CONTROL PLATE FOR FENDER STANDARD TELECASTER. A majestic presence to this guard, you really have to be in the same room to get the live impact. The photo above is of the same pickguard & control, changing though different angles, same natural inside light source. Each 'Mirror Spark' starts with a full mirror surface, the Spark pattern is embedded into the mirror background surface, using alternative triple direction. This method truly brings out the supreme interactive surface light reflects that stainless steel is best at. Sparks from any angle. See Close Up surface view of Mirror Spark pickguard.